← Bible Contradictions #4: Is only god holy? Bible Contradictions #5: Who slew Goliath? The David v. Goliath story is a great one–the little man defeating a giant. It is often used as a metaphor for other modern day feats, such as a small business owner winning a lawsuit against a major corporation. Alas, it’s been attributed to–not just David–but also Elhanan. It should also be noted that the King James version of the bible adds the words “brother of” in 2 Samuel 21:19, making it appear that Elhanan slew Goliath’s brother. But this was nothing more than an attempt to fix a glaring contradiction. Next time I’ll look at how David allegedly brought down the giant. This entry was posted in Atheism, Bible Contradictions and tagged Atheism, Bible Contradictions, Christianity, contradictions in the bible, God, God of Abraham, Goliath story, Judaism, Religion. Bookmark the permalink. 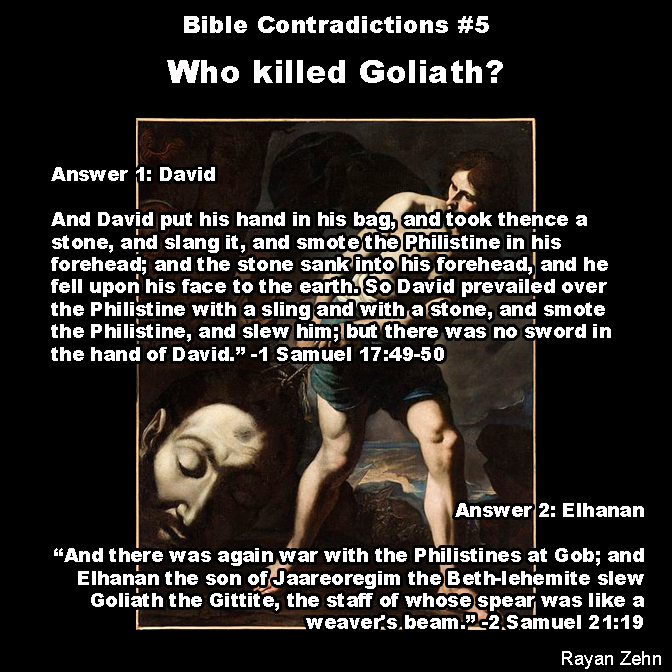 14 Responses to Bible Contradictions #5: Who slew Goliath? How do you know that Goliath of Geth is the same Goliath that David slew? There were many giants among the Philistines as 2 Samuel 21 clearly states. And just like there were other men named Jesus in Palestine circa 30AD, they all were not all Jesus of Nazareth. So your response is, partially, that there were many giants in biblical days? Giants. Not tall men, but actual giants? Do you really believe in giants? Couldn’t you just say the story is allegorical and that names are not what we should be focusing on? It’s not “my” response. It’s in the Bible, 2 Samuel 21. People with an agenda cherry pick verses without understanding their relationship to other verses. People who really want to understand the Bible try to understand its original intent. They don’t try to warp it and wrap around and agenda. The atheist agenda is to discredit the Bible. I agree that “the story is allegorical and that names are not what we should be focusing on.” But I also agree that there might have been many Goliaths among Philistine and “giant” is a very relevant term. Hyperbole is a common literary technique. The point is not who slew whom and how, but that a small boy with a lot of faith and determination defeated a giant with a sling. I know, some Christians would disagree, but many would also agree. I think, we should commend people who read the Bible and ask questions. We should also welcome a chance to refresh our known knowledge and resolve a few contradictions. In my experience, the Bible reveals contradictions in our heart. Instead of people judging the word, the word judges us — much like all the traps Pharisees laid out for Jesus ended up to work against them. I think, paying attention to these little inconsistencies is examining the leaves and failing to see the forest, studying the letter instead of studying the content and the spirit of the book. So basically agrudzinsky what you are saying is ignore the inconsistencies in the bible and embrace the meaning and spirit. OK you carry on living like that being spoon-fed what to think by religious leaders, politicians and the media in your submissive woolly-thinking but I will go on rationally questioning the world around me. The majority of the information contained in the bible is either borrowed from elsewhere or invented, those with a “Christian Agenda” seek to credit the bible despite its clear and abundant inaccuracies and made up nonsense. Why contradictions bother you so much? Don’t ignore them – find explanations why they exist and how to interpret them and live with them. Bible has contradictions. Scientific theories have contradictions. Is light a wave or does it consist of particles? Can it be both? How come? Most scientists are OK with both theories although they contradict each other. Or, perhaps, people swallow both theories fed to them in high school without understanding? Some contradictions cannot be resolved or understood. They are simply a part of reality. They can only be accepted. Do you understand how an electron can be located in two places at the same time, for example? Bible Contradictions Explained #5 is in. Rayan, this is actually the only contradiction I have found thus far, but I hope what I have presented stands as the most reasonable answer. Also I am in the process of packing up to move out of state. I will try to get a few more episodes finished before we move which will be around the 15th of this month. Should be settled and the series picking back up by the beginning of April. So if I fall off the radar for awhile, that’s whats up. I have every intention of answering all 55 supposed contradictions. MY FRIEND, READ IT VERY CAREFULLY, THAT ELHANAN KILLED THE BROTHER!!!!!!!!!!!!!!!!!!! OF GOLIATH………….READ THE BIBLE CAREFULLY AND DON’T INFLUENCE OTHERS WITH YOUR WRONG READINGS AND INTERPRETATION. Devil’s advocate here, Rayan did mention in his post that the Brother of was inserted into the King James Text. Just because the English translation says Brother of, doesn’t mean the original Hebrew did. You don’t need to be an ancient Hebrew or Greek scholar to study these topics however. We live in the modern age of information, all at our finger tips. There is no reason an Atheist has for not believing in Christ, equally there is no reason a Christian shouldn’t have his theology together. Fantastic time to be alive. How is this for an explanation? The Bible is allegory and David is a fictional character that is the composite of the stories associated with his “Mighty Men”. The authors of the allegory wanted to make sure that this was understood, so they deliberately tell the story associated with of one of his mighty men so the reader sees the connection. David’s marriage to the “wife” of the mighty man Uriah the Hittite is another way this is communicated. Because these stories were mostly taken from foreigner’s, the true nature of David could be easily determined by outsiders and this led to a rewriting of the story of David that dropped the best known mighty men stories. This is why the two lists of Mighty Men in the Old Testament do not agree. One is the original story list and the other is the revised list. This story is told allegorically in the account of Samson and his 30 companions. With the help of Samson’s foreign wife, the 30 companions solved Samson’s “riddle” and Samson had to get them new “clothes”. The name “Judas” is derived from the Hebrew word “yada” which means “to know” and this is supposed to identify Judas as the founder of the Gnostics. Judas undoubtedly interpreted the allegory about David and exposed the fraud. However, Gnostic teachings about Old Testament allegory were corrupted by Philo and others and this led to the creation of Christian Gnosticism. Censorship then wiped out all literal records of the original Gnostics. David chose five smooth stones to kill Goliath and his brothers. Goliath had 4 brothers. Wise men in their own opinion ONLY have the 1st.